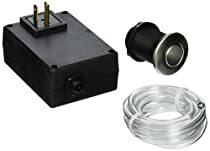 I bought this Mountain air switch after looking at many different ones, there were no reviews that I could find. The price was right & half price compared to some omline sites for the same one, I took a chance & I am glad I did, what a great air switch, easy to hook up, is well built & works great. 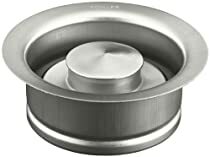 You don't have to hold the button down like other leading switchs to keep it running, you press once to start & press again to shut off & it screws right into the extra hole in the sink. Have confidence when you order this air switch because it is a good switch & for the money you can't beat it. I'd never seen these types of switches before and was sure glad they existed when I had to come up with a way to control the power to my disposal since there was no switch controlling the receptacle below the sink. This fit the bill just fine. It was simple to install and works like a champ. Just a little puff of air is all that's needed to switch the control on and off. Also, since the button is located right next to the faucet, it's very handy compared to reaching for a wall switch, which is probably not the safest thing to do if your hands are wet. Since the button is nothing more than a plunger, there is no risk of electrocution. This switch works really well. One thing that has not been mentioned is that the switch does not turn on and off both plugs at once. It turns one off and the other on and then visa versa! Nothing wrong with that since I only really needed one plug but I thought that it was an interesting configuration and wondered why it would be made like that. It does work well though. If you are in need of an air switch...buy this unit and you will not be disappointed.